When I adopted a healthier lifestyle, I began choosing leaner varieties and cuts of meat and measured portions. Now it's a way of life for me. White-meat poultry and many types of seafood are naturally lean when the skin is removed and they are cooked without added fat. Chicken and turkey breast are especially lean. Heavily marbled (thin streaks of fat within the muscle) beef and lamb are high in fat and calories. 5. Turkey: white meat (or breast). Ground dark turkey thighs also contain little fat. As soon as I get home from the grocery store, I trim all visible fat from the meat, divide it into serving sizes using my scale to weigh it, and freeze. One portion of lean meat is 4 ounces raw. If you are measuring a cooked portion of meat, a serving is 3 ounces. It is important to remove as much air as possible from freezer bags or containers to prevent freezer burn. Frozen meat should be used within six months. If you have taken care to buy the right meat, do not add a lot of extra fat when you cook it. For every tablespoon of oil you add to the cooking process, you add more than 100 calories. 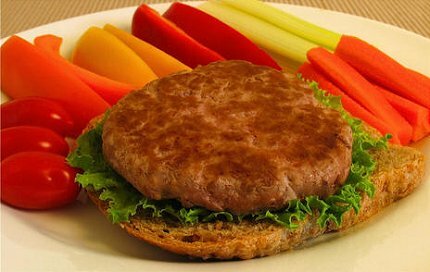 Here is a wonderful turkey burger recipe that can be used with any ground meat. Be sure to buy the extra lean. One pound of ground turkey provides four servings. Check the fat content, as ground turkey sold in tubes usually has a higher fat content. Toppings might include: Roasted or chopped red or green bell peppers, grilled or chopped onions, raw spinach leaves, lettuce, and tomatoes. In a bowl mix ground turkey, egg, and onion. Add seasoning. Shape into four patties. Grill or cook in a frying pan until browned on bottom; flip over. Cover the pan with a lid and turn off the heat to allow turkey to continue to cook until done. Serves four. Note: I usually prepare ground turkey by dividing a pound into four equal portions, forming them into patties, placing them in Ziploc sandwich bags and freezing. Remove patties from the freezer and place in the refrigerator a day or two before you plan to use them. Dian's book Tipping the Scales in Your Favor shares her weight loss journey. For years Dian tried and tried to lose weight, but it was not until Jackie Keller said to her in California, "I can help you lose weight," that she caught the vision and lost more than 115 pounds. Most important, she has been able to keep it off. Get Dian's book today and begin the journey to healthy living. Go to www.DianThomas.com to learn more. Dian's Complete Library Package: Get the whole enchilada -- all seven items -- save 60% off the retail price of $119.93. Now only $49.99. It's all here: the books Holiday Fun Year-Round, Fun at Home, Roughing It Easy, Recipes for Roughing It Easy, Backyard Roughing It Easy, AND two DVDs: the Dutch Oven Cooking and Creative Holiday Ideas. You'll be ready for anything! From outdoor camping adventures to creative home activities, these books will give you power-packed ideas to create memories your whole family will cherish. An excellent gift for anyone looking for fun, clever and exciting ideas. 5 books / 2 DVDs go to www.DianThomas.com.